I typically try to avoid reacting like the guy in the cartoon here. 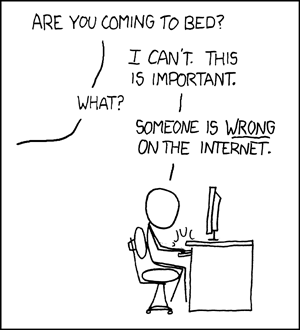 Hopefully I’m continuing to do that, because as long there’s an internet someone, including myself, will be wrong on it. And in that vein this will hopefully be brief because I have more important things to do than correct people that are wrong on the internet. But (here I go) IMHO, there is a bunch of junk being said about Apple’s newest device, the iPad. Now, before you turn me off, this is not (hopefully) a glowing, koolaid-drinking, fanboy review of how the iPad is going to change your life and be the greatest thing since sliced bread. Still with me? Good. My thoughts will be organized around several major complaints I have read/seen/heard in the last couple days. Well, duh, it’s your own fault. There was so much hype about this device and how it was going to have this feature and that feature and change this industry and be a __(fill in the blank with your device of choice)__-killer and serve breakfast in bed and be bathed in unicorn tears and everything else. I’ve followed the Apple rumor mill for several years and I don’t think I’ve ever seen more hype over the announcement of a single product than this one. Of course this is only fueled by all these “leaks” from “sources” and every Mac blog analyzing them for every detail. Puh-leez! If the device had every feature that people wanted it would end up looking like some Franken-tablet. Remember one of Apple’s goals (and i think a good one) with every product is intuitive simplicity (“it just works”). The iPad succeeds at this. Despite all the hype, I refused (tried to at least) to get caught up in it. (I was still eagerly tuned in to the liveblogs Wednesday afternoon.) I realized that there was no way they could deliver a product that would meet everyone’s wishlist. And they weren’t trying to. Personally, I deliberately tried to set my expectations low, so that whatever was delivered I would hopefully be able to view it objectively. I was hoping for a big iPod Touch (more on my expectations at the end). And that’s pretty much what we got. I most recently saw this basically voiced as: “But Steve Jobs said that a netbook doesn’t do anything better, and a netbook does a lot of things better than the iPad.” That’s wasn’t Jobs’ point. His point was that a netbook doesn’t do anything that a laptop or a phone can’t do better. In other words, the iPad fills the gap between the phone and the laptop better than a netbook does. The things that Jobs targeted (email, browsing, personal video watching, reading, viewing photos, etc.) the iPad can do better than a laptop or phone. This is largely due to the iPad’s multitouch interface. People like tactility (for lack of a better word). It’s fun to touch stuff and make it respond. The iPad succeeds at this. And may its tribe increase. No single item has caused Apple more trouble than flash support. As a web developer, I view flash as a necessary evil, kinda like IE 6. The sooner it dies the better. And if one of the main reasons Adobe comes up with to encourage Apple to support it is so that people can view immorality (the link is safe, believe me), may it die faster. And along this line, if you want to accuse Apple of having a “walled garden” (more on that in a moment) you can lay that blame at the feet of Adobe and their proprietary plugin too. At least I can develop for the iPhone/iPad for *free. This, as a geek and amateur “hacker” is probably my biggest beef, as I like to be able to tinker with things under the hood. But I understand why Apple does this. It’s another one of their commitments to the user experience. All the apps in the App Store I’ve seen have nice GUIs. And as I almost entirely download free ones, which are the more likely to have “ugly” designs, I think I’ve seen a fair sampling. This is not true for programs as a whole. When I was primarily a Windows user, one of my favorite things to do was find “new” freeware, so I know how bad GUI designs can be. This is not the case in the App Store. It doesn’t have X feature. 2) It doesn’t have it yet. This is another thing I’m not completely crazy about, but again, I understand. Would it have been great and possible for Apple to include a camera (front/rear/both) and keep it at the same price point? Probably yes. So why didn’t they? As a consumer, I don’t like this, but it’s called built-in obselecense. Apple is a business, and their goal is to make money. Lots of it, as Jobs reminded us with the brief history at the beginning of the keynote. Some of these features could have been added in, but if Apple waits and adds them in later, the consumer has more reason to upgrade. For that reason, I rarely, if ever, buy first generation products from anybody. Also, some of the desired features (multitasking in particular) is not a hardware issue but a software issue and can be updated at anytime. It’s very likely we’ll see some type of multitask support in an iPhone OS 4.0 upgrade later this year.